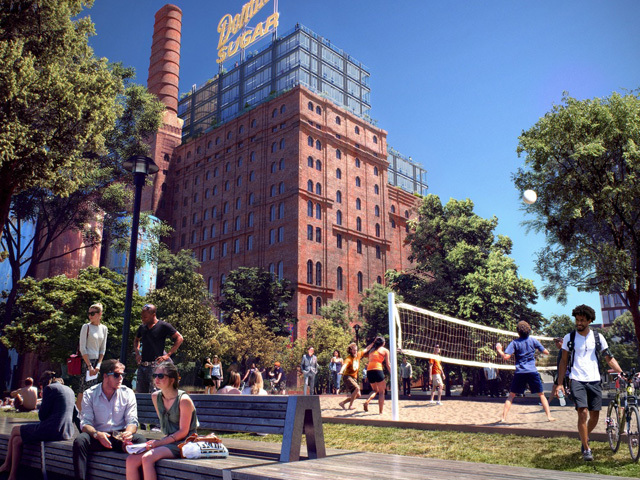 A new development in Brooklyn, New York, includes the revival of the historic Domino Sugar factory and the creation of much-needed public space in the neighbourhood in the form of a waterfront esplanade, sporting fields, gardens and children�s play zone. Slated for a Summer 2018 opening, the Domino Park development by real estate developer Two Trees Management will revive an 11-acre site along the East River in the Brooklyn neighbourhood of Williamsburg. A central component of the site will be a new public park and recreation space. Including residential towers and the redevelopment of the former Domino Sugar factory – by Partnership for Architecture and Urbanism and Beyer Blinder Belle - the mixed-use site development will reactivate the area and create more usable space for the community. 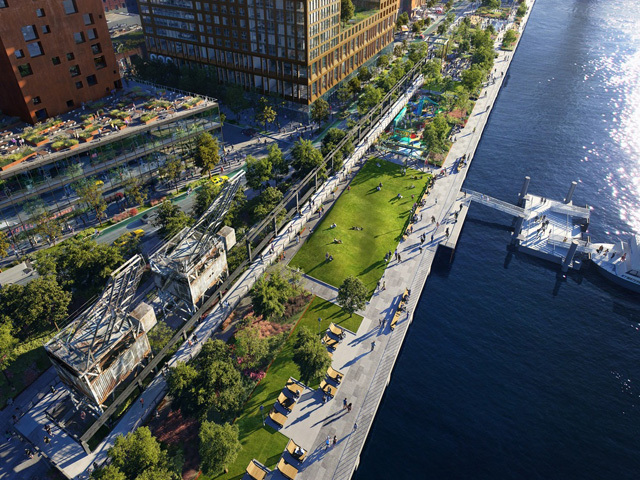 The new Domino Park will feature a waterfront esplanade and six acres of park space and will produce better connectivity between the city and the waterfront. Facilities in the new park will include a range of recreation spaces, such as sports fields, expansive lawns, gardens, and a children’s play zone. Also included will be a 5-block-long ‘Artifact Walk’ comprised of a 450-foot-long (137m) elevated pedestrian walkway from the former sugar warehouse to the city. “The Artifact Walk was inspired both by the raw sugar warehouse and other buildings on the site that were connected via catwalks, with the buildings essentially functioning as a large, interconnected machine,” explain Two Trees. In a design that puts historic preservation at the forefront of the redevelopment, the James Corner-designed project will include a number of industrial artifacts from the site, including 21 raw sugar warehouse columns, approximately 585 linear feet (178m) of crane tracks, and over 30 industrial items to be incorporated within the park’s landscape. “We were deeply inspired by community input and the site’s rich history when creating Domino Park,” said Lisa Switkin of James Corner Field Operations. Upon completion, the project site will cover the full 11-acre area with a mixed-use programme of community facilities that include residential, office and recreational spaces. 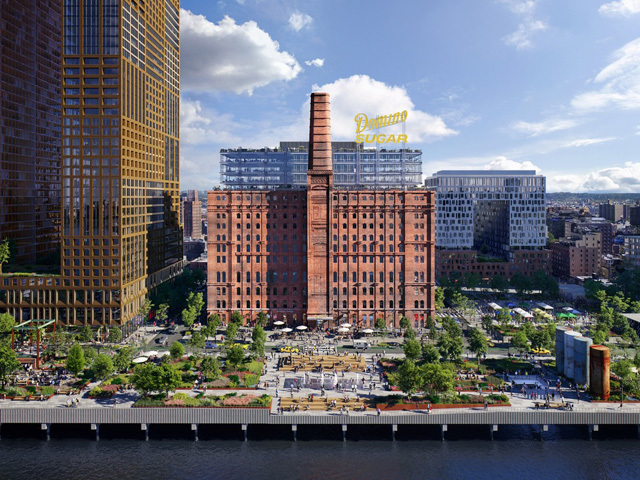 Through the work of Partnership for Architecture and Urbanism and Beyer Blinder Belle, the landmarked Domino sugar refinery will be repurposed into a 380,000-square-foot (35, 303sqm) office campus that helps to preserve the history of the region. 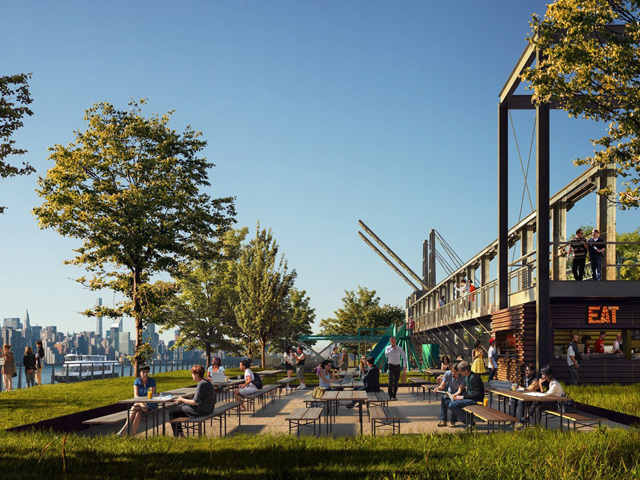 “By opening Domino Park in its entirety next summer - ahead of the site’s new waterfront buildings - we are delivering on our commitment to bring waterfront access and much-needed public park space to North Brooklyn,” said Two Trees principal Jed Walentas.